Social media has become an important part of daily life. In fact, it is estimated that 60 percent of adults use social media regularly. Social media is a great place to share photos and update people on what is going on with your life. 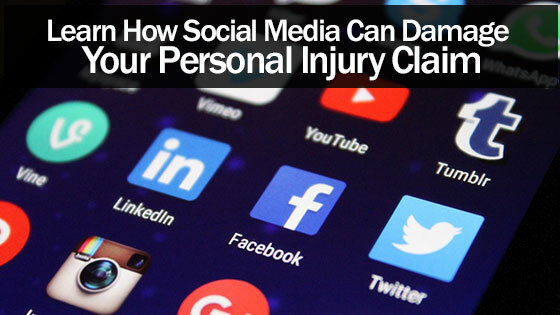 However, you have to be careful with social media if you have a personal injury claim. Broken bones, chronic pain and traumatic brain injuries are often the result of a personal injury. People deserve to be compensated for their pain and suffering. Many people turn to social media when they are hurt. However, any post that you make on social media can be used against you. One of the keys to winning any lawsuit is to provide evidence. Social media is the easiest place to find evidence. Insurance companies will look for any evidence that shows your injuries are not as serious as they claim to be. Here is an example of how social media can hurt your case. You have been in a car accident. You are trying to get compensation because you have limited mobility. However, you post a picture of yourself going hiking. This will ruin your personal injury claim. The insurance company will likely say that if you can go hiking, then you are not hurt that bad. It is a good idea to take a break from social media while you are trying to get compensated. However, if you decide to use social media, then you will need to avoid doing the following. Most people will not get on Facebook and post a status saying that they ran a red light. However, it is important to remember that any statement that you post can be used against you. Even if you post something like “I got into a wreck”, that can still be used against you. You may feel like you should apologize after getting into an accident. However, social media is not the place for an apology. You will reduce your settlement amount if you apologize on social media. It is a good idea to take pictures and record videos of the accident scene. The pictures and videos can be used to support your personal injury claim. However, you do not want to post any videos and photos on your social media. You should only share this information with your attorney. You do not want to post pictures of yourself at a game or concert. If the insurance company sees this, then they will say that your injuries aren’t serious because they do not interfere with your daily life. Many people use social media to vent. You can seek support on social media, but you do not want to rant about your accident. Facebook – Facebook has over 1 billion users. This is the first place that lawyers and insurance companies will look. Twitter – Over 31 million people joined Twitter within the last two years. Not only is Twitter popular but it is a quick way to spread information. Instagram – Instagram is one of the fastest-growing social networking sites. One seemingly innocent photo on social media can ruin your claim. Call our law offices today at any of our convenient locations to speak with a personal injury attorney and get a free consultation.